For those of you with cats that like to spend some time outside, there is the KatKabin, an outdoor cat house (doesn’t it kind of look like a cat?). The KatKabin is developed to withstand extreme temperatures and has a polystyrene floor that adds extra insulation in cool weather. And if you’re worried that someone will take your KatKabin, then you can even screw it to the floor to keep it secure. This entry was posted on Tuesday, May 15th, 2007 at 3:51 am	and is filed under Cats, National Dog, Cat & Pet Info, Products & Services for Cats & Dogs. You can follow any responses to this entry through the RSS 2.0 feed. Both comments and pings are currently closed. 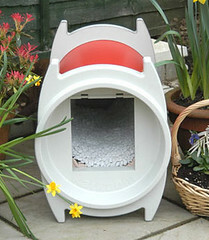 The kat kabin looks like the outdoor cat may want to check out, Is this heated? My 41 house cats love to be in front of the heat source,so we bought several electric heaters and put the cat beds about 3 feet away and all the beds are always full.